Earlier this year, Mini unveiled the Cooper Coupe, basically a Mini Cooper with two fewer seats, a separate trunk, and a chopped roof. 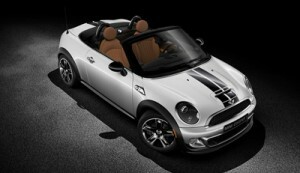 Now, Mini has officially introduced the Coupe’s partner in crime, the Cooper Roadster. The Mini Cooper Roadster goes on sale in the U.S. early next year, with prices likely starting around $27,000 for a base car. Based on Mini’s pricing schedule for its other models, figure on a Cooper S running about $30,000 and a JCW going for somewhere near $37,000. That’s getting awfully steep, but even more than other Coopers, this Mini is just as much fashion accessory as car. At that price, though, we’d at least hope for a power top.